Andreas Trossek writes about the exhibition "Evident in Advance" by Dénes Farkas. Three years ago when Estonia was in the midst of adopting the euro, a fine art photography fair was held in Tallinn showing, among others, examples of work by Dénes Farkas, an artist approaching his forties. 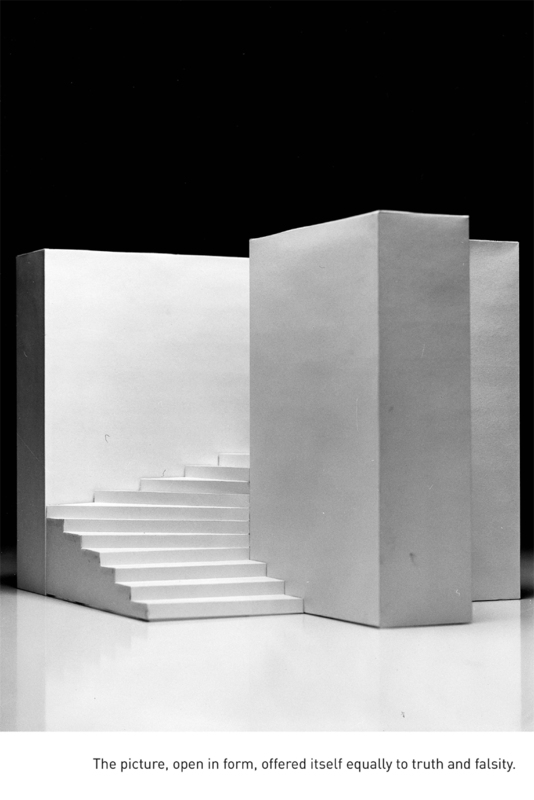 Installed in display cases, these black and white analogue photographs of delicate paper models were suggestive of quiet, staged interiors, exteriors and objects. Legend has it that the works were not sold, despite the fact that due to a careless typo the prices had been listed in kroons rather than euros.1 In other words, the visitors all missed the chance to buy artworks that will remain in the art history of Estonia of the 21st century at giveaway prices. Indeed, this may be declared with some certainty now that Farkas has represented Estonia at the 55th International Art Biennale in Venice and his work is being shown at first-class art fairs like the Armory Show and ARCOmadrid. Dénes Farkas belongs to a generation of artists who were too young in the 1990s when global interest in Post-Soviet regions was at its highest. Clearly, nothing has come easily to this generation. When they started out in the 2000s, standing in their way were not only the "artist-dissidents" who had emerged triumphantly from the Soviet era but also their own teachers, who had met with moderate international success and continued attention from curators abroad. It was therefore somewhat predictable that, compared to their forerunners, this generation developed their author positions in the Estonian art scene over a significantly longer period of time and in the process of a much larger flow of information relying on (glocal) evolution rather than (local) revolution as the key word. Indeed, why should a 21st century artist in Estonia be occupied with "patricide" on the scale of some local village brawl if they can think bigger instead? So "Evident in Advance", last year's Venice project now on display at the Kumu Art Museum, is also a result of thought processes that originated in and around 2006 or 2007 when the artist, of Estonian and Hungarian roots, began to photograph his series of paper models, which were mostly accompanied by quotations and textual fragments in multiple languages when displayed at exhibitions. As an art historian I have categorised Dénes Farkas as a post-conceptualist.2 No creator likes categorisation, but there are several reasons in the background in this case. First, Farkas combines images and words in his work so that the text is never reduced to mere caption nor the image to mere illustration. This kind of artistic thinking only becomes possible in the second half of the 20th century when conceptualism declares the idea to be more important than the execution and modern art museums across the world fill with texts, books, archives and other such textual installations by artists that place verbal information in the foreground. (True, before that cubists and Dadaists too had cut up fresh newspapers and glued together collages, but the result in one way or another was reduced to a part of the composition.) Second, Farkas' handling of the material and retro aesthetic of the image also indicate a conceptualist legacy: we see here an artist who, in our current digital age, continues to work with analogue technology and exhibits a series of black and white photographs which inevitably leave a nostalgic impression and are essentially not far removed from, say, Bernd and Hilla Becher's architecture photography of the 1970s. Third, there is also the historical background because traces of conceptualist thinking, which subsequent generations of artists were in one way or another compelled to critically relate to, were also to be found in Estonian art of the 1970s and 1980s. Alongside conceptualism, Farkas' laconic pictorial language has also drawn on the minimalist tradition, which necessarily adds a certain "commerciality" to his works––especially in the Estonian context with its collective habits of consumption, where for decades Nordic modernist design has been considered a sign of good taste. Still, the artist's fragmenting approach suggests destructive rather than affirmative primary impulses: he does not believe; he does not hope; he does not really engage in anything but sowing doubts. Also noticeable is the artist's reliance on deconstructivist philosophy, or at least its methodology, which is often associated with conceptualism. Like Jacques Derrida before him, Dénes Farkas too seems not to believe that it is possible for him to tell the viewer his whole story since some connotation, a trail, a translation error, a différance always remains somewhere "around the corner". It is therefore hardly surprising that as a literary text Farkas' project "Evident in Advance" leaves the impression of an intentionally "failed" interpretation of Bruce Duffy's book "The World As I Found It" (1987), which in turn leaves the impression of a "failed" interpretation of Ludwig Wittgenstein' biography and so on. The failure, therefore, is programmatic. A failure that always takes us back to the logocentric prison of language, speech and writing; one that is inevitably inscribed in this chain of communication from the outset. What cannot really fully be uttered cannot fully be thought through beforehand either. There is no way out. And after the failures, we are left with only silence. "Evident in Advance" was the 2013 Estonian Pavilion show in Venice and is therefore yesterday's news, as it were, for the professionals. However, the subsequent fate and marketing efforts of the show within Estonia have been remarkable. While most of the previous Venice projects have been shown to the local public in the Tallinn Art Hall block or the Estonian Artists' Association Hobusepea Gallery (either before or after the Biennale, depending on the circumstances), this year the whole Venice project was hurled into vans, basically on the closing day of the Biennale, and brought straight to Kumu Art Museum – as a newcomer to shine in the Parnassian glory amidst the classics of art history. This gesture can be read as an institutional compliment extended by the national museum to the Center for Contemporary Arts Estonia, who has been producing the Venice projects since 1997, but also as a desire on the part of Kumu to museumise as quickly as possible each contemporary artist who has poked their nose outside of Estonia. Lest it happen, God forbid, that a Venice artist should end up receiving more recognition outside Estonia, as happened, for example, with Mark Raidpere in 2005 or Kristina Norman in 2009. On the other hand, the facilities in Kumu are always neat, clean and well lit, so why not. * A shortened version of this article was published in Postimees 21. I 2014. This is the author's full version of the article. 2 Center for Contemporary Arts, Estonia, online database (2012), see http://www.cca.ee/kunstnikud/denes-farkas. Andreas Trossek works as editor-in-chief of KUNST.EE.